Anda lives in Sherman, Connecticut and began painting in acrylics when she was 16. From there she also went on to discover oil painting. Acrylics, however remain her favorite medium, which she has worked in for over 35 years. She attended Parson School of Design and graduated in 1983 with her bachelors degree. She has had many accomplishments in the art world, including interviews with both local and national publications, such as American Art Collector, Who’s Who in America, Country Gardeners Magazine, Victoria Magazine, numerous awards and recognition for work as a painter. 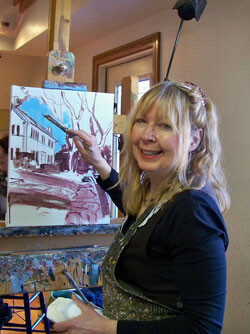 Her paintings and techniques are published in two books by North Light Publications. Her works are currently represented by several galleries in and around New England and to her credit she has had many one woman shows with great success. In July of 2007 she painted 4 large paintings that are part of a permanent collection purchase by Northwestern Memorial Hospital in Chicago. For many years Styler painted on location, these days she paints both in and out of the studio. She continues to explore subject matter, but is especially drawn to the magic of the Litchfield Hills, and the New England landscape - the hidden places that are not often seen. New England barns are fast disappearing. There is a special magic in the landscape where the old barns are, the fields that are full of wild flowers and grasses. Ms. Styler is also an avid gardener and many of the flowers that appear in her work come from her own garden. Working with shadow, light, vibrant color, mood and sky she hopes to bring excitement to her work that reflects the world around her and capture the unique and lasting beauty that only nature reflects.